•	Available for nearly 600 handgun models. •	New clips ensure quick and convenient adjustments. •	Improvements focus on all-day comfort and concealment. In today’s world, being prepared for anything is your number one priority. You need a comfortable, concealable and reliable holster for self-defense. Many inside-the-waistband (IWB) holsters come preset with cant, ride height, and retention. These holsters usually have poorly designed features that make concealed carrying uncomfortable. Carrying with an uncomfortable holster defeats the purpose; you will find yourself readjusting your holster all day, or sometimes even deciding to leave your firearm at home to avoid discomfort. Experience a comfortable concealed carry holster that is easy to use, available for a wide variety of makes and models, and can be customized for your exact preferences with the all-new Cloak Tuck 3.5 IWB Holster. With the Cloak Tuck 3.5 IWB Holster, carrying concealed has never been this easy and customizable. Adjust your cant and ride height for a perfect fit with our new and improved toolless clips. Their twist-and-lock technology allow you to make quick, on-the-go adjustments with no tools or hardware. To wear, simply place the holster inside your waistband, hook the clips on your belt or waistband, and enjoy soft, breathable concealment with our new CoolVent™ neoprene against your body. We understand the importance of a quality holster that can be worn comfortably any time and any place. Our holsters are made by veterans and pro second amendment citizens who carry every day. We want to ensure you are satisfied with our holsters and give you confidence in our products' quality. 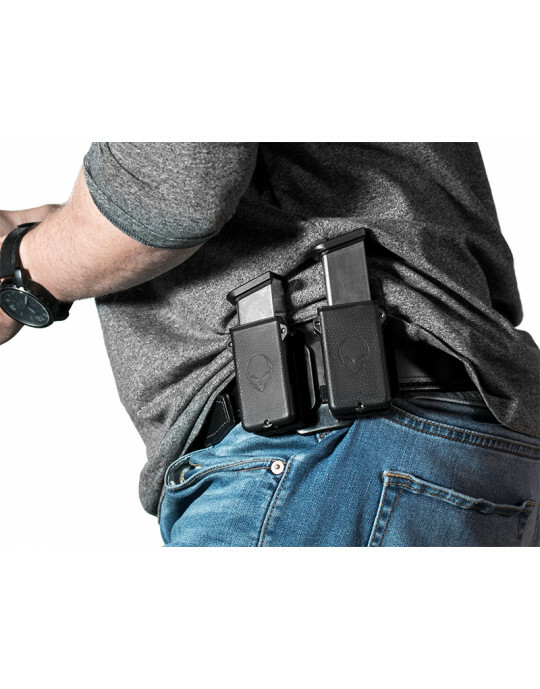 Our 30-Day Test Drive gives you the option to try our holster for a month, and if you are not impressed, feel free to send it back for a refund. Our Forever Warranty ensures you can keep your purchase for life, and we will cover all cosmetic damages or defects. Conceal your firearm with ultimate peace of mind and try the Cloak Tuck 3.5 IWB Holster today. I have several Alien Gear Holsters, and love each of them. Back in October 2018, I bought the 3.5 IWB for my Glock 42 . I promise you that I have worn this holster every single day, without fail, since it arrived. It has shown zero wear, and has formed itself to my body like a glove. I wear it in the 4pm position. I am able to wear this holster with any clothes that I choose, even shorts while mowing the lawn! I really like this holster set up accept for putting it on and taking it off like others have mentioned. Hopefully it will get easier as I get used to it. For me trying to pry those plastic clips apart is an effort. I'm glad it's not just me that finds this. I found if I pull my belt out first then you don't have to open the clips quite as much. Putting it on once you find the right position is a little easier. As suggested I put it on with my pants open same taking it off. Over the years I have bought several of the A.G.H. shells. They fit the Neoprene backing like the Black Leather one I had bought the shells for originally. i've never had customer support greater than alien gear!!!. And well let's be honest there's not another holster out there that compares when it comes to comfort and capability... They're surpassing everyone!!! Long story short, arrived days b4 I assumed it would, and was LITERALLY perfect. Fits like a dream, comfy, and sturdy!